Vehicle fuel injection systems relied on conventional oxygen sensors since the 80's. In the early 00's oxygen sensors started to give way to more precise air fuel ratio sensors. An air fuel ratio (A/F) sensor measures oxygen content of the exhaust in a wider range. Looking similar to a conventional oxygen sensor, the A/F sensor has more wires. It is also known as "broadband lambda sensor" or "lambda probe." The air fuel ratio sensor is installed in the exhaust manifold or in the front exhaust pipe, before the catalytic converter. 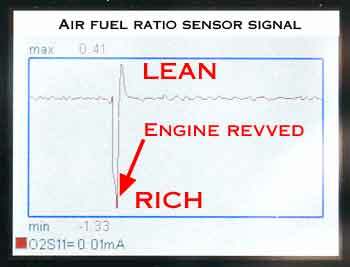 The job of the air fuel ratio sensor is to measure the oxygen content in the exhaust and provide feedback to the engine computer (PCM). Based on air fuel ratio sensor signal, the computer adjusts the air to fuel ratio to keep it at the optimum level, which is about 14.7:1. Problems with air fuel ratio sensors are common. Often a sensor gets contaminated or simply fails. In some cars, the heating element inside the sensor fails causing the malfunction. For example, in many Toyota and Honda cars the code P0135 may be caused by a failed heating element inside the sensor. See how the heating element of the A/F sensor is checked in this article: code P0135. 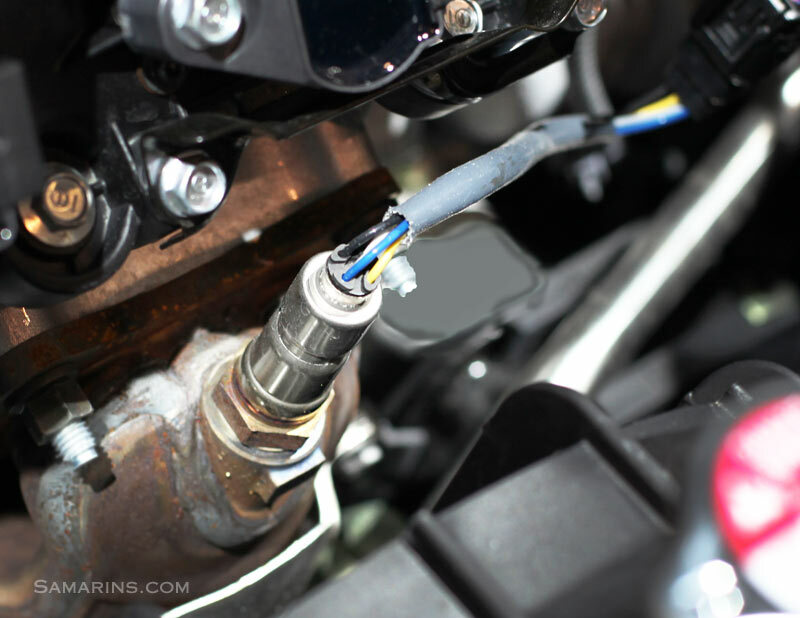 In some cars, a sensor wiring may get shorted out after rubbing against metal parts. For example, in older Mazda 3, the sensor wire may rub against the bracket and short out causing the code P0131. When the engine computer detects that the air fuel ratio sensor signal is out of expected range it illuminates the check engine light. Most common OBDII trouble codes related to an air fuel ratio sensor are P0131, P0134, P0135, P0133, P0031 and P1135. Are there any symptoms beside the Check Engine light? In some cars you may notice a drop in the fuel economy or some minor driveability issues. Checking the air fuel ratio sensor with a scan tool. An air fuel ratio sensor is diagnosed following a troubleshooting procedure for the trouble code that has been set. The first step is to check for related technical service bulletins. The wiring and connector the sensor heater circuit must be checked. Then, depending on the trouble code, the sensor signal must be tested with a scan tool. 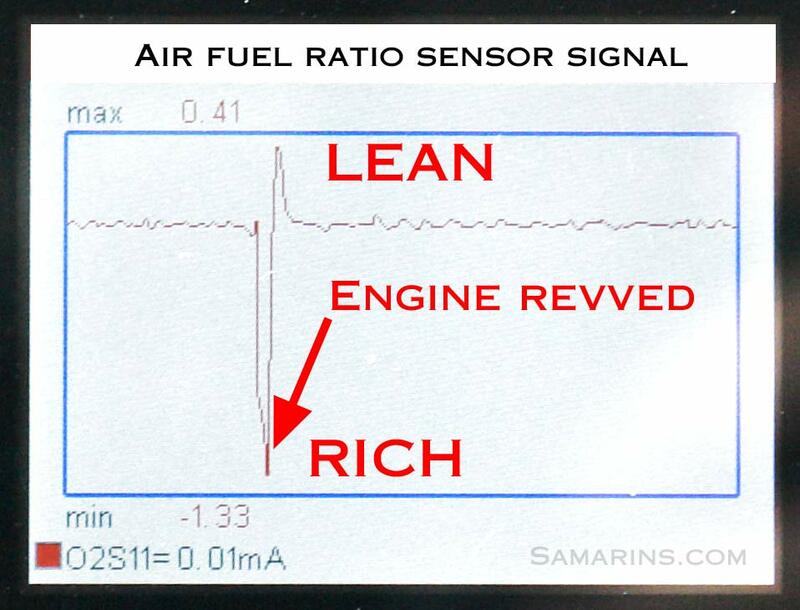 See this chart of the air-fuel ratio sensor signal on a scan tool: when the engine is revved, the signal jumps to "rich", then as the RPM drops and the fuel is cut off, the sensor indicates "lean". After that, the signal goes back to normal. This air fuel sensor works properly. Often, the sensor may work properly at the time of the inspection. In this case your mechanic may recommend replacing the air fuel ratio sensor to eliminate possibility of an intermittent fault. In a car, an air fuel ratio sensor is designated as Sensor 1 (upstream, before the catalytic converter), Bank 1 or Bank 2. A rear (downstream sensor, after the catalytic converter) is always Sensor 2. The term Bank refers to a row of cylinders. In most inline 4-cylinder engines there is only one bank, Bank 1. In some inline 4-cylinder engines with two catalytic converters, V6, inline-6, V8 or boxer engines there are two banks of cylinders;, and each bank has its own air fuel ratio sensor (Sensor 1) and a rear oxygen sensor (Sensor 2). The Bank 1 is usually the one that contains the cylinder number 1. For example, Toyota in the TSB T-SB-0398-09 specifies that in the 2GR-FE, 1MZ-FE, 3MZ-FE V6 transversely mounted engines, the Bank 1 is the one closer to the firewall, while the Bank 2 is the one facing the front of the vehicle. Different manufacturers designate banks differently. To know for sure, check the model specific service manual. When replacing an air fuel sensor there is often a choice to install an OEM or aftermarket part. Aftermarket sensors work fine most of the time. However, we came across several cases where an aftermarket sensor was causing a problem that was fixed after installing an OEM sensor. If the price is reasonable, using an OEM sensor is always the first choice. Another reason to use an OEM sensor is that often manufacturers update the part design to eliminate problems that were discovered after the production. For California-certified cars, the part number for the air fuel ratio sensor might be different. It's best to order the correct part using your VIN number. Replacing an air fuel ratio sensor costs $65-$320 part plus $50-$150 labor. 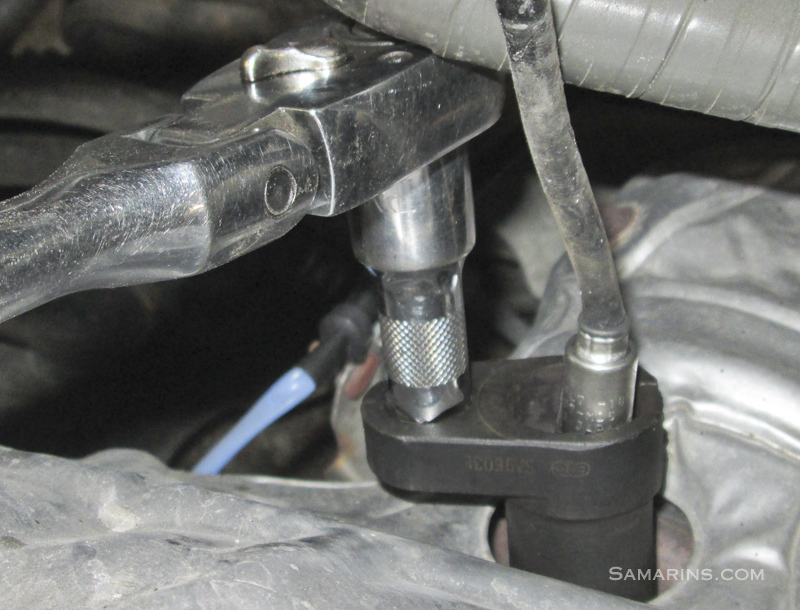 To replace an air fuel ratio sensor DIY, you might need a special oxygen sensor socket. Often a sensor may come loose initially but then seize up in the thread. In this case it must be worked slowly back and forth using a penetrating spray.